We did it again. The holidays are fast approaching and here we are with only a day left until Christmas and we procrastinated posting our annual holiday cookie blog. This blog is dedicated to all those last minute bakers that want to make something semi-homemade. Cheers to all. Rice Krispie ™ treats are yummy, gooey, cookies that we have loved for years. While most of our blog posts are dedicated to food made from scratch, we have tried to replicate these goodies before using puffed brown rice and homemade marshmallows with depressing results. Since it is the holiday season (we believe in many different holidays during this time of year, not just Xmas!) we decided to get off our food crate – er, soap box – and work with the classic, time-tested recipe as a guide. Our current infatuation with the Rice Krispie treat can be blamed on our recent trip to Yountville and Bouchon Bakery. The bakery sells beautiful Neapolitan Rice Krispie treats featuring decadent layers of chocolate, strawberry and vanilla. They are delicious! But like most of the recipes that inspire us, we like to alter them, just a bit, and after finding Bouchon’s recipe online (these treats are very popular at Easter) and seeing the ingredients list, we knew that this one would be a very fun and delightfully easy challenge. All the makings of snowball treats. Kellogg’s Rice Krispie website features a recipe for their version of “snowballs.” Home cooks rate the recipe a paltry 3 out of 5 stars and we knew that with a little help we could make them better. Using white chocolate, coconut extract, chocolate extract, and Valrhona white chocolate pearls (inspired by Bouchon’s crispies) we knew we could boost the chocolate and coconut flavors without going overboard. They turned out great rolled in sweetened coconut flakes and placed in individual paper cups. Of course, a few of the items used to make them so special are not so easy to find in most grocery stores. Lucky for us our, neighborhood grocery store is Andronico’s and as fate would have it, Jason found Valrhona pearls on display at the store. We doubt the average Walmart or town grocery store carries these candy treats, so feel free to omit them if you can’t find them. Bring 2” of water to a boil in a saucepot and place a bowl on top to create a double boiler. In the bowl, melt the white chocolate chips and then stir in the butter, marshmallow and extracts until the mixture has completely melted together. In a mixing bowl, fold the Rice Krispies and crunchy pearls into the marshmallow mixture. When cool enough to handle, shape the Rice Krispies mixture into small snowballs. Place the coconut on a plate and roll the balls in the coconut, gently pressing the coconut into the balls. Cordial cherry treats in the making. Our other Holiday recreation is an updated Cordial Cherry. Again, taking inspiration from Bouchon’s Rice Krispie recipe we have made a part candy, part chocolate Krispie treat that we think is kind of cleaver. Using Bouchon’s recipe for their strawberry Krispie we changed the dried strawberries to dried cherries and added a little Maraschino liquor adding a little kick to them. The chocolate version is completely Bouchon’s recipe. 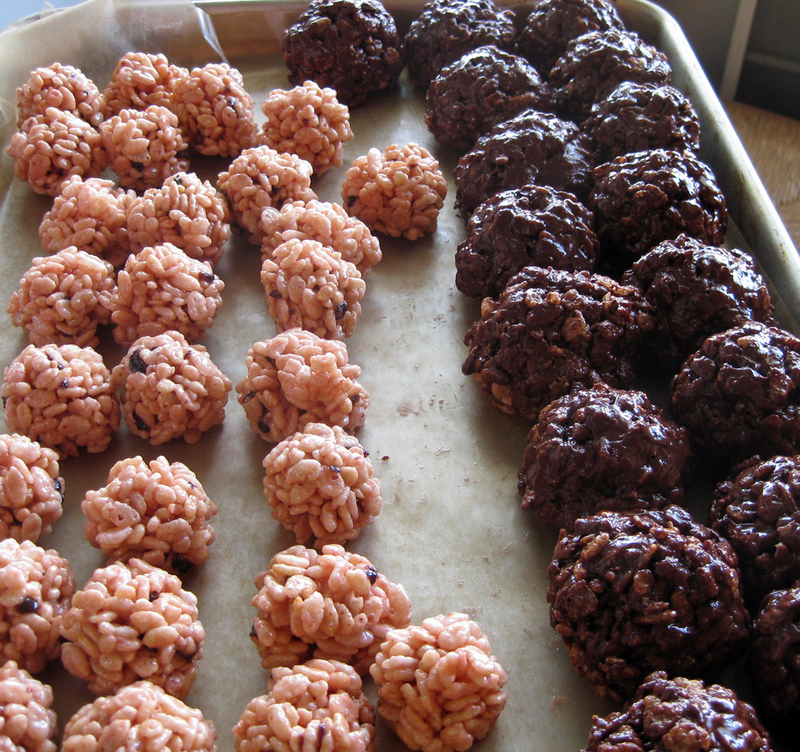 To make the cookies we rolled small balls of cherry Krispie and then covered those in the chocolate Krispie. The results were cute, fun and very festive. In a heavy bottomed saucepot add the chopped dried cherries and Maraschino liquor, cook over medium heat until the liquor is almost evaporated. Add the butter, marshmallow and food coloring whisking together until everything is completely melted. 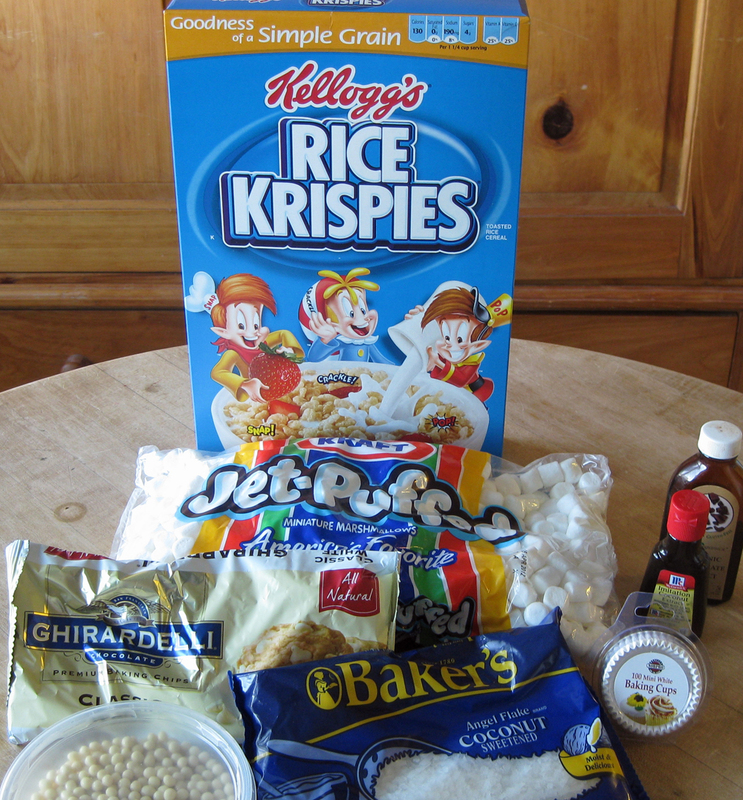 In a mixing bowl, fold the Rice Krispies into the marshmallow mixture. When cool enough to handle, shape the Rice Krispies mixture into small tablespoon balls. Bring 2” of water to a boil in a saucepot and place a bowl on top to create a double boiler. In the bowl, melt the chocolates together and then stir in the butter, marshmallow and cocoa powder until the mixture has completely melted together. In a mixing bowl fold the Rice Krispies and crunchy pearls into the marshmallow mixture. 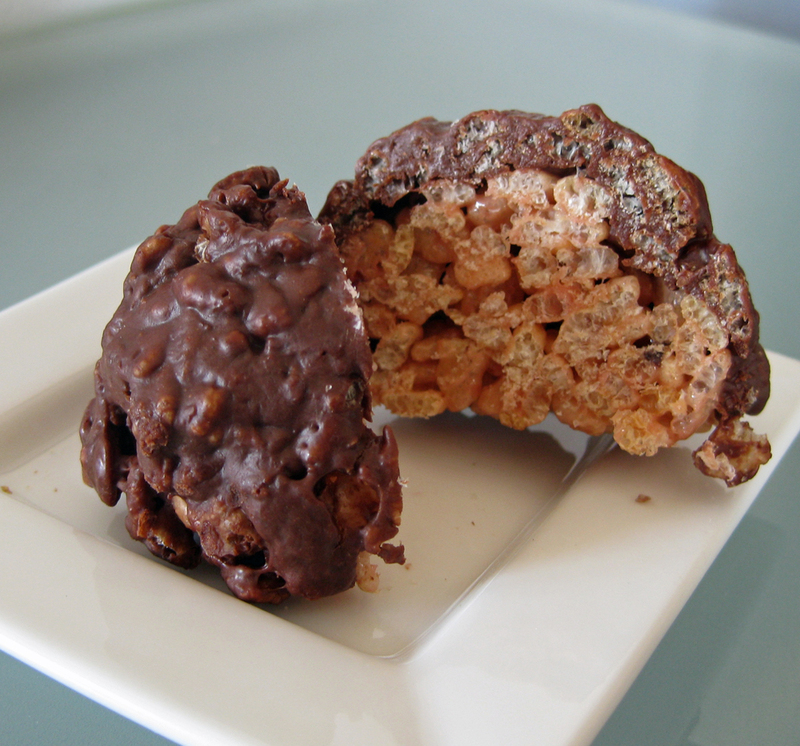 When cool enough to handle, take one of the cherry Rice Krispie balls and cover it with some of the chocolate Rice Krispie, leaving the bottom of the balls with only the cherry Rice Krispie.